"I have just arrived home from the megalithomania conference and it was mega - as the young may say. And yes a bit manic as well. Every speaker was well prepared and had material to share to inspire us all, even the novice stoner. 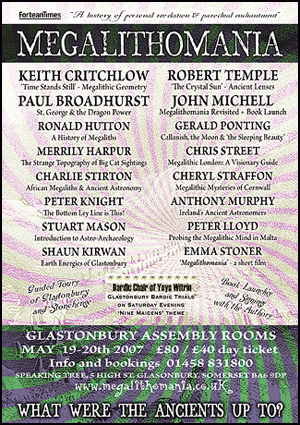 Not that there were many of those in more ways than one at Glastonbury Assembly Rooms. From the oldies we had new ideas, better technology and ways to show us their connections/ revelations; the new faces were brimming over with enthusiasm to share their secrets! A refreshing change from 'croppies' I think. I could barely write fast enough to record the fascinating words of the great Irish researcher Anthony Murphy and the equally speedy historian Ronald Hutton. We were taken by picture and story from Africa to Ireland, the islands of Malta and Lewis, and given a thorough overview of our own UK sites. Chris Street had me thinking I would like to visit London! Now that would be a miracle, I hate cities. We looked at the relatedness of leys, light phenomena, lenses and cats; we considered the stars, planets, solar and lunar cycles. No stone was left unturned? Well actually we megalithomaniacs would not touch one too roughly let alone turn it. Would we??? The issue of Tara in Ireland and the new road through her site was clearly close to all our hearts. My thoughts (and cash) goes with the lads who are keeping that fight going. We thought Swampy's mile was bad down here in Devon, well this development is nothing less than an outrageous tragedy. The happy 'accident' of the Bardic Finals was just icing on the cake. I loved it all.Thank you all, the organisers, the speakers, the traders and the audience. This conference was a very special event indeed".